‘Cause every good DJ has a rhythm he sticks by. ++What type of equipment do you bring with you? We’re all about the party at Century Tree Productions and the gear we bring to every wedding reflects that truth! I bring two L1 Bose Speakers, a mixer, a turntable, two wired mics, a fog machine, a bubble machine, eight mounted lasers, six uplighting cans, two revolving laser heads and two mounted special effects LED light rigs. I will bring 50 -100 glow stick necklaces for the guests. For outdoor ceremony use, I utilize one L1 Bose Speaker and a wireless lapel mic for the officiant. If the venue allows, I will bring a handful of confetti cannons to detonate during the climax of my performance. ++How do you choose which songs to play? During our free consultation, the bride and groom will let me know how they want their wedding to sound and feel. After the consultation, the bride and groom are sent a Wedding Music Template document in which they are asked to select songs they want played for their special moments (first dance, cake cutting, bouquet toss, etc.) and a limited number of specific songs they want played on the dance floor. Combining the information I obtain from the consultation and template document, I construct playlists based on the bride and groom's preferences. 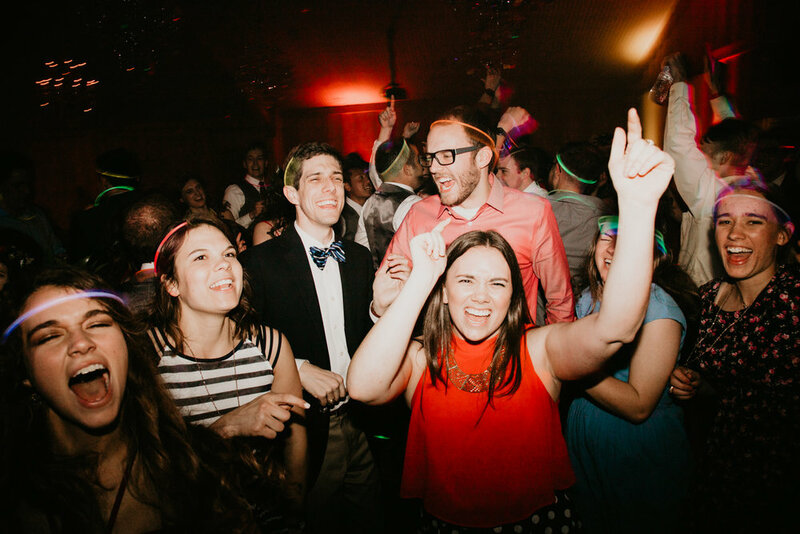 When the dancing segment of the reception commences, I will read the crowd and determine the best combination of popular songs, classics, standards, remixes, and throwbacks needed to keep the party going until the bride and groom's exit. ++What type of genres and songs do you gravitate toward? Our performances are designed to be high-energy and joyful experiences. If you’re looking for a relaxed or all-country dancefloor experience, I may not be the DJ for you. I trend toward 70s classic rock, 80s power anthems, 90s hits, and modern (and remixed) pop and hip-hop, with occasional breaks for two-step country, group line dances, and romantic slow jams. Simply put, I am a DJ for the bride and groom looking for a big and bold multi-genre dance party on their wedding day. During our consultation, you’ll get the opportunity to customize your experience based on your and your guests’ preferences (and we’ll help you out!). If a dance party is a priority for you, then I’m your DJ. ++Do you play songs with profanity or lewd sexual content? Normally, I do not. My default mode is to remove all strong profanity from my music. Unless a couple specifically requests an unedited version of a song, I generally refrain from playing songs with explicit content (because, c'mon, your grandmom is there). However, this is up to the bride and groom’s preference. Occasionally, the wedding couple will request unedited versions of songs to be played after a certain hour at night (for example, after 9 p.m. following many older guests or younger children have left the reception). ++Do you take requests from guests? This is a tricky one. Generally, I will take requests into consideration only if I have the requested track in my musical library, the song fits into the flow of the evening, and if the track fits within the parameters outlined by the bride and groom during our consultation.